I’m sure when you think of a Tarot reader, you picture a little old lady wearing a turban with a feather and plastic jewel pinned to it, a crazy (possibly fake) accent and of course, a crystal ball. In reality, anyone can read Tarot and use it to increase their self-awareness. So what exactly are Tarot cards and how can they help you in every day life? Contrary to the popular belief that Tarot cards can straight up tell the future, they are more of a tool to ask questions that your subconscious, more than likely, already knows the answer to. The cards aren’t going to tell you what your boyfriend is going to get you for your birthday (You’ll have to bug his Mom for that answer), but can give insight on questions about why you and your S.O. are going through a rough patch or why you’re feeling anxious. A typical Tarot deck is usually comprised of 78 cards that are split into The Major & Minor Arcana. The Majors are the cards you’ve probably heard of like The High Priestess and The Empress. The Minor Arcana is made up of four suits: Wands, Cups, Swords and Pentacles and are numbered from 1-10. The cards are like a story; The Majors are the big events that happen and the Minors are all the little details. Or the way I like to look at it, is like ice cream (yes please). The Major cards are the different flavored scoops and the Minors are all of the toppings that will change and add to the sundae. The best way to learn the meanings of the cards is to ask a question, pull a card and before you run to Google, ask yourself what the card means to you – how the imagery makes you feel and how it may relate to your situation. Then, look up the meanings in multiple places (books, online, Instagram, etc.). Different readers and sources are going to have different ideas of what the cards mean and these meanings may or may not resonate with you. That being said, the most important thing to remember is to listen to your intuition and always go with what your gut feels the cards are saying. Now that you know the basics, let’s get into how we can use Tarot to help us on the daily. You can use the cards to gain insight on situations or even find out more about yourself. Say you’re feeling like you’re in a bit of a funk. The cards may tell you to exercise your creativity and start that passion project you’ve been putting on the back-burner or that you should book that weekend trip with your gal pals. We all feel some anxiety from time to time–but sometimes it’s tough figuring out the reason. First, take some deep breaths (bet you never heard that one before – but hey, you know it helps), select your cards and use your subconscious to decode what they are trying to tell you. For instance, the suit of Pentacles represents money and material things. So if you pull a few cards in this suit, you may realize you’re worried that your roommate isn’t going to come up with her half of the rent on time (get it together, Rachel…). Crossing paths with anxiety myself, I often carry my Tarot deck with me (along with my crystals, makeup bag, wallet, peppermint headache oil… Let’s just say I had to invest in a slightly larger purse.) Even if I know what I’m feeling anxious about, pulling a card can help calm my nerves, stay positive and let me know that everything is going to turn out alright. Speaking of positivity, there seems to be a stigma around the “scary” cards in a Tarot deck. Not going to lie, some of the names are pretty creepy: The Hanged Man, The Devil, Death(?!). Scary names and imagery aside, the way I look at it, is there is no such thing as a “bad card” or “bad reading.” For example, the Death card does NOT mean you or anyone around you is going to die. This card actually means the death of something negative and moving on to the next chapter (a negative relationship or a job with a negative workplace). Every card, even the seemingly negative ones, has a positive and learning aspect to it. Learning Tarot can seem a bit overwhelming, but my biggest tip when learning it is to trust your intuition. With some practice and patience, you’ll be able to use Tarot whenever you’re feeling stressed or want to know what exciting things are coming up next for you! Katie Paige is an Intuitive Tarot reader from Chicago, Illinois. 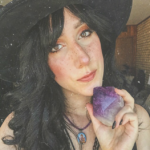 She shares Witchy Wellness tips and tricks on her Instagram and has a website where she sells crystals and offers Distance Tarot Readings.